"Chiropractors, like other primary care providers, sometimes employ diagnostic imaging techniques such as X-rays and CT scans that rely on ionizing radiation." 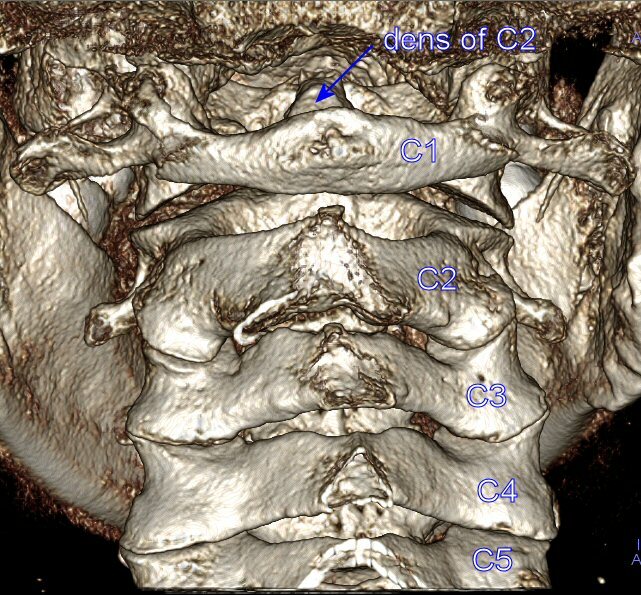 Although CBCT (cone-beam CT) is designed for dental specialists and general dentists, chiropractors who specialize in Cervical may benefit greatly from utilizing CBCT. The effective dose of ionizing radiation given by a medical CT (fan-beam CT) is estimated as about 100 times more than that given by a dental CT (cone-beam CT). Human has seven (7) cervical veterbrae, C1-C7. C1 aka (also known as) atlas, C2 aka axis, and C7 aka vertebra prominens because it has a long and prominent spinous process. The following (Figs 1-3) are some images of human C1-C5. Notice the high quality of the 3-D images. The most distinctive characteristic of this high quality is the existence of the separation of the vertebraes: space for the intervertebral discs. Fig. 1 Posterior view, showing C1-C5. 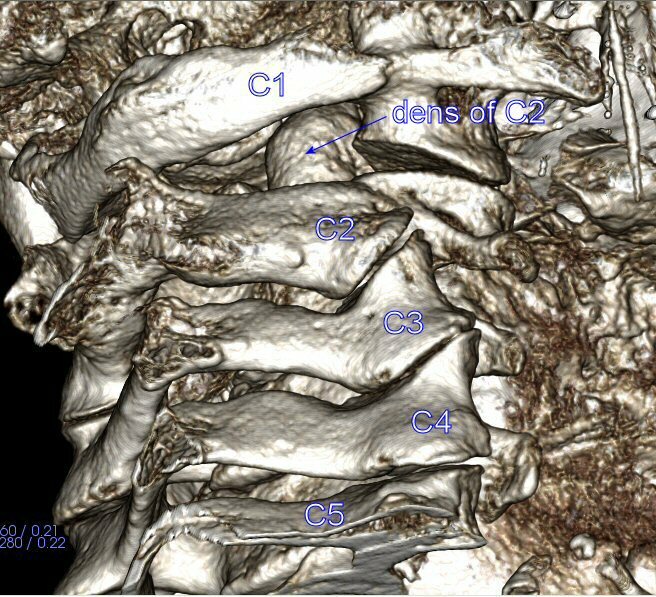 Dens of C2 is labeled for ease of identifying the cervical veterbrae. Fig. 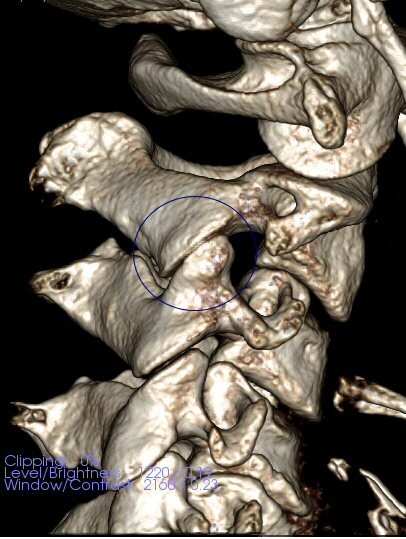 2 Posterior-oblique view, showing C1-C5, seperated by intervertebral discs. The discs cannot be seen clearly. Dens of C2 is labeled for ease of identifying the cervical veterbrae. 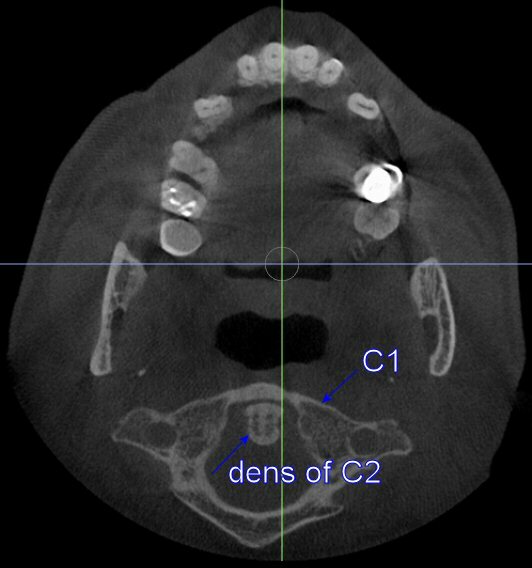 An example of a patient who has a symptom associated with C2-C3 malalignment is shown in Fig. 4 (see circle).